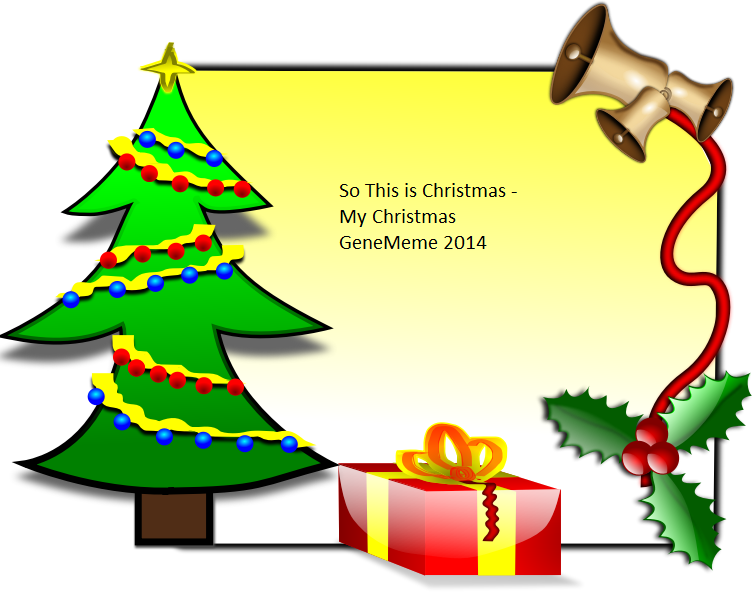 My friend Sharn from FamilyHistory4U blog has set us all a Christmas geneameme challenge.In previous years I’ve posted on the Geneabloggers’ Advent Calendar of Christmas Memories and this meme offers a change of pace for me. I’m lucky that I’ve been able to check with mum on a couple of the questions. 1. 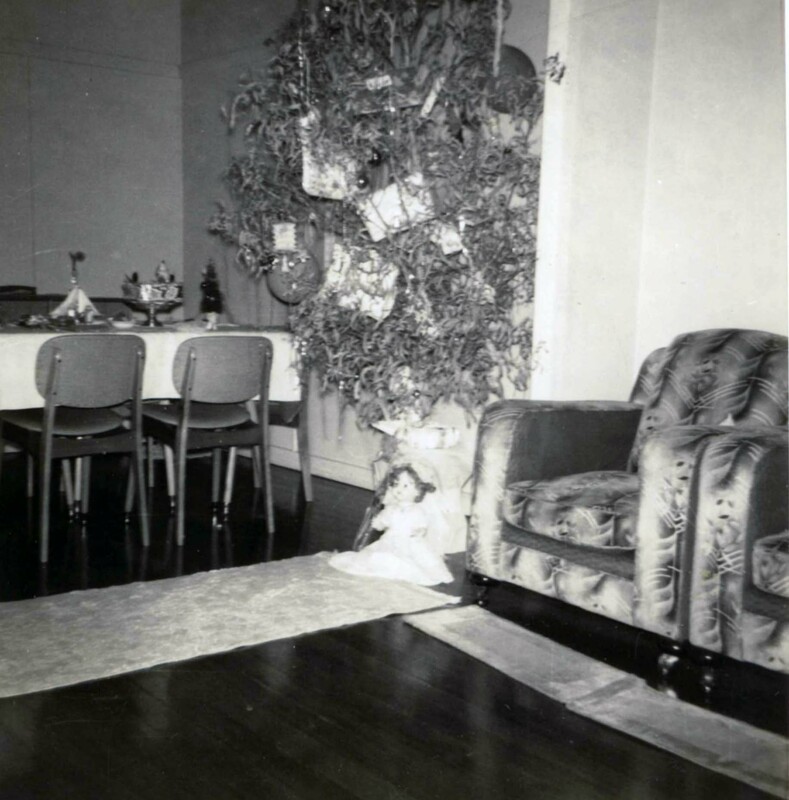 What kind of Christmas did you have as a child? 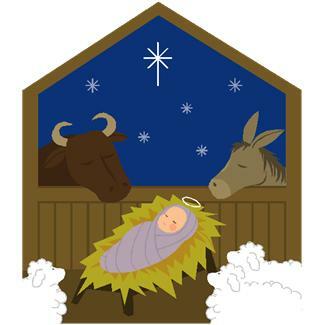 Christmas was always a religious event at our house with Midnight Mass and adoration on Christmas Eve. I’d often pester my father, who was a non-Catholic, to come with us….poor man, he got no Christmas peace. Our Christmas celebrations were pretty low key as we have a small extended family and so it was usually just roast dinner with Christmas pudding and cake. We always spent Christmas at home, apart from when we’d visit my maternal grandfather’s house across town – no mean feat on a public holiday using public transport. Mum tells me we mainly did this before her mother died, and only occasionally after that, which surprises me that I can remember, as I was only a small child when she died. The maximum number of people we had were my own family, plus grandfather and sometimes one set of maternal aunts and uncles and cousins, so between 7 and 11 tops. For the life of me I can’t remember my paternal grandparents, who lived next door, being invited to partake in Christmas lunch….don’t go there, sigh…perhaps Grandma came over after Grandad died. Mum tells me the rellies would come over on Boxing Day mostly. When I was a child we never went away on holidays at this time of year because it was peak period and expensive. When we lived in Brisbane I used to dislike (hate/loathe) sitting in the northbound traffic to visit rellies, while the southbound freeway was totally free. Mostly we’re at home for Christmas, though once when we lived in Papua New Guinea and once (or twice?) since we’ve been in Darwin, we’ve been back to Brisbane for Christmas. Once we had a white Christmas in Lucerne (some of the family) and once Himself and I returned from a trip on Christmas Eve, just a tiny bit jetlagged. And a few years ago we had Christmas in Tasmania with DD1. I may have written to Santa (surely everyone did?) but I have no recollection of doing so. We certainly didn’t leave anything out for Santa or the reindeer – I remember being a bit mystified to find that other people did that. Yes, we always had a Christmas Tree and it was always a small gum tree (eucalyptus) from down the creek bank near our house I’m pretty sure we only put it up close to Christmas so it would survive. We still maintain our family tradition of putting up the tree together, though now it’s an artificial one, and we always decorate it while playing Christmas music. It basically stays up over Advent. Mum and I would decorate the tree together as Dad would either be on shift-work or think he was too clumsy. I think we had a mix of handmade and special glass baubles. I see in one photo we had balloons – I guess gum trees are less spikey than firs. 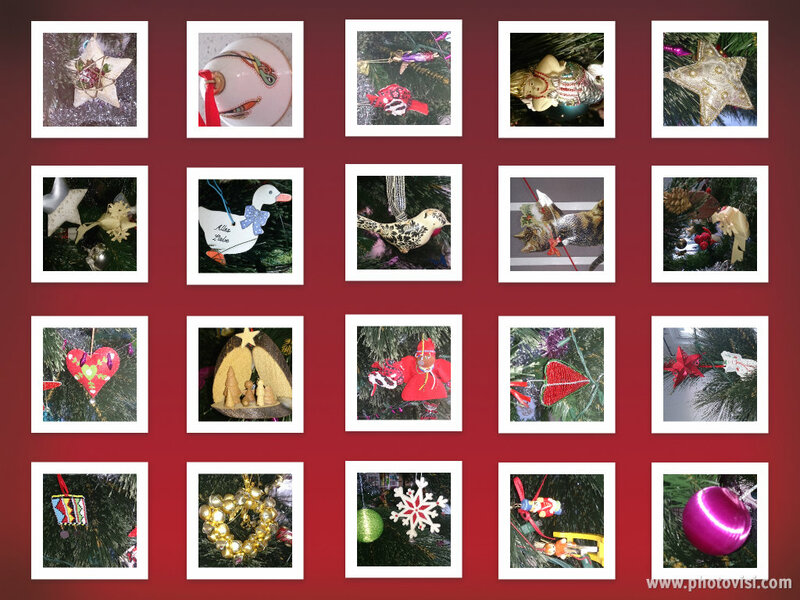 We have a wide variety of Christmas tree decorations – no colour-coordinated themes for the Cass mob. Some go back to the first year of our marriage, some were made by our children, some were gifts and quite a few have been brought back from our travels which has become a family tradition, helped by the fact we often travel off-season. Not really. I think we may have had some sort of wreath but no lights as they were not readily available then, as far as I know. I don’t remember anyone else doing it either, unless it was those paper chains we made as kids…but then it is the rainy season in Queensland (and Darwin). These days we put up a wreath and solar lights in the frangipani. Mum would write our Christmas cards and send them to a small group of family and friends…she has amazingly neat writing, even in her advanced years. What did we do with them? Hmmm, I think we may have cut them up and used them for craft and Mum would save the stamps and send them to the Missions. If I remember correctly they were hung on tinsel with our clock in the centre (why, I don’t know). Remember when the postie would do two mail “runs” a day in the stinking heat of a Brisbane summer? We would always have a cold drink for him when he came by with his big pack…I think he was more like Santa than Santa himself. 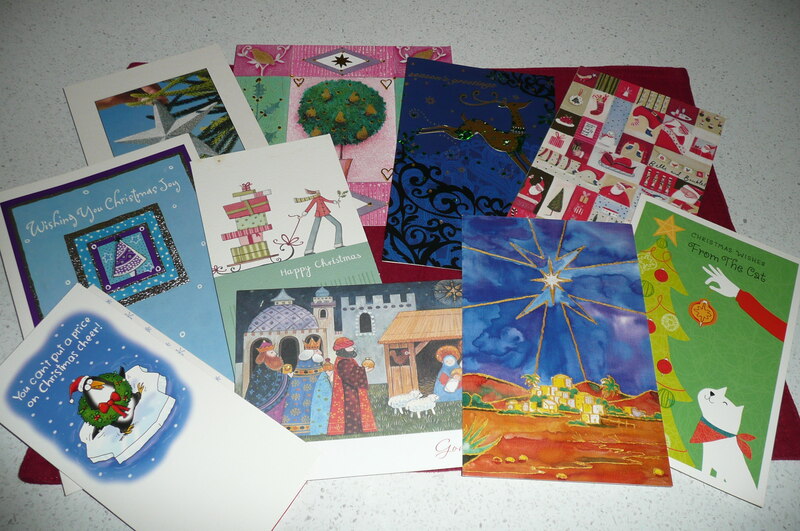 These days I send electronic cards to some, paper cards to the older generation and try to ring my interstate friends for a catch-up chat…more fun, and informative, than a card. 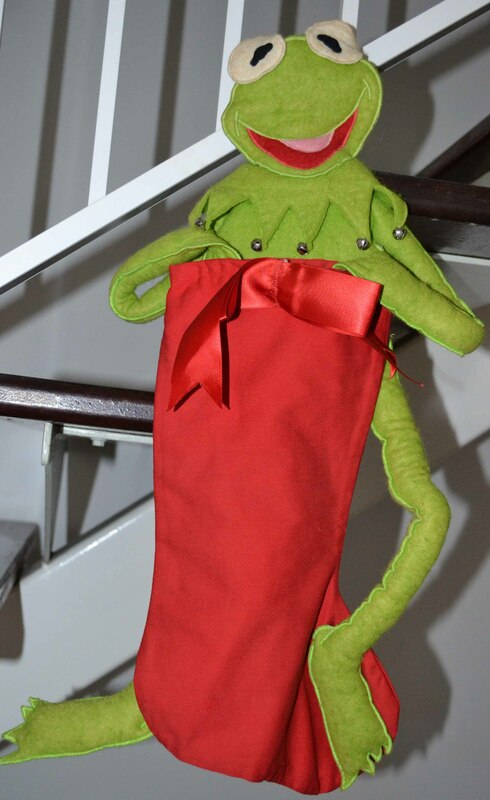 I made this kermit stocking for my youngest daughter but it is really only used for decoration. No, I never had a Christmas stocking other than those ones you bought in the shops with little round lollies, blowers, cartoons etc, which I really liked. All our presents would go under the tree. In my husband’s family there would be one gift at the bottom of the kids’ beds and they were told when they first woke up they could open that and read (it was usually a book). We maintained that tradition too, but the joy of Midnight Mass is that it makes the kids too tired to wake up super-early. I got presents from Mum and Dad and Santa, something from my grandparents and a small gift from my aunts and uncles, and I would swap gifts with close friends. I think I made small gifts for my parents and I remember the first time I was able to go shopping in Brisbane’s Fortitude Valley for gifts for my parents. Mum’s confirmed we didn’t do gifts for the nuns who taught me. I remember that it was traditional to always leave out some beer as gifts for the garbos in those days when they had to carry the bins and empty them manually. The milko also got something. These days we’ve rationalised our family present buying: the adults exchange a secret Santa gift to a limited amount and I swap presents with some of my friends. Ironically my oldest friend and I don’t do presents any more – we ran out of inventiveness – but if we see something during the year we’ll buy it at the time. Each year we have a craft session with the grandchildren when they make gifts for their parents. They seem to have a good time and so do we. I remember some school holidays when the girls were young and we had chaos while neighbourhood kids made fymo necklaces and decorations. Well I’d be stretching it being confident about this but one I very much remember was a large Readers Digest book on animals. I was desperate that it would be among my gifts and was thrilled when I did, but was it a Christmas or birthday gift? I still have it in my library. Actually my favourite Christmas present was always a book, any book. A sad Christmas would be one with no book (don’t think that every happened). I still have many of them, especially some from one of Mum’s close friends. Was there an unrealistic present you wanted but never received? I was going to say “no” but on further reflection, every year I wished for a baby sister or brother but it never happened. Obviously that was not in God’s plan for our family. 12. Did you give gifts to teachers and friends at school? I thought I might have given presents to the nuns in high school but mum thinks not, and since she would have done the buying (what mum doesn’t?) then I’d guess not. I don’t think it was the almost compulsory activity it has been with our children onwards. Perhaps we just gave them a holy Christmas card. Again, close friends exchanged gifts but the wider circle of girls would exchange holy pictures with messages on them. 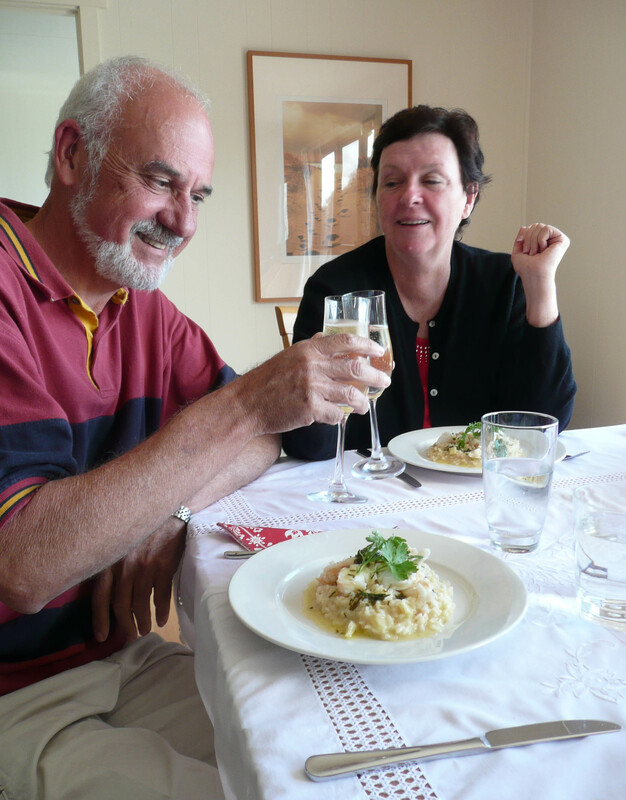 Christmas in Tasmania was all about the seafood and a fantastic meal by DD1. Green Peppercorn Xmas cake recipe from the Australian Women’s Weekly (I think) circa 1990. CLICK TO ENLARGE. Now this I do remember! Despite the heat we always had a hot Christmas meal. Chicken was an expensive treat in those days and I don’t recall anyone having turkey or seafood. Roast potatoes, carrots and onions with peas for vegetables. Steamed Christmas pudding, custard and cream for dessert (yes please Dad would say, meaning all three). Shortbread was made according to my Scottish grandmother’s recipe and we would always have crystallised ginger on the table….one of Mum’s favourites. Dad might have a beer (remember that Scottish mother) but no one else had anything alcoholic. We always had our meal inside on a formally dressed table with all my parents’ quality linen and crystal…one of the few times each year that the crystal made an appearance. Yes we made the shortbread (see above) which I still make to Grandma’s recipe. The pudding was also her recipe and is a delicious, moist version. Mum made the same delicious Christmas cake for decades which I also made until I found a new recipe for a Green Peppercorn Christmas Cake which we really like but which no longer likes me…sigh. 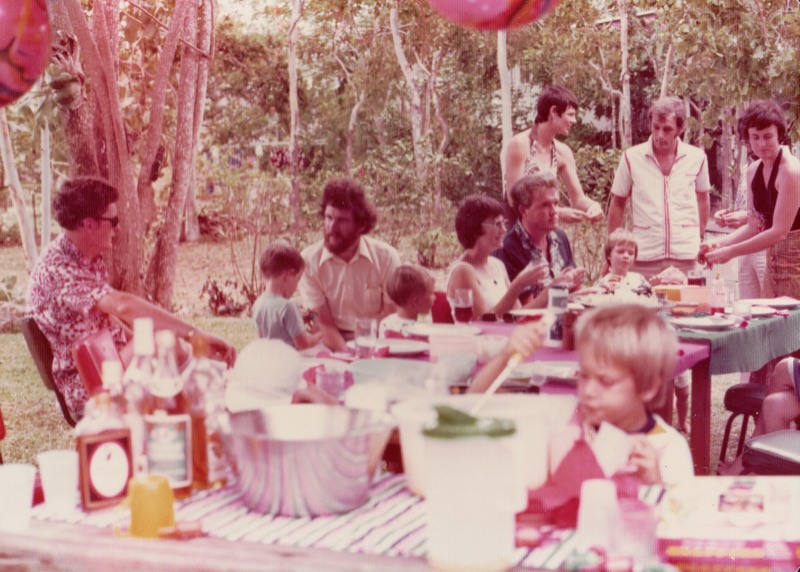 Back yard Christmas celebrations Gerehu, Port Moresby. Bon bons were always on the table too with their usual sad jokes but still fun. We didn’t go carolling – that was done around the church services and we also listened to them at home. And yes, grace before and after meals –always, not just at Christmas. In Papua New Guinea where we were all far from our families of origin, we would hold Christmas gatherings of friends and rotate through different households from year to year. It was always great fun. Me, in a choir?? Thank heavens, no! Mum has a good voice and I would sing at home but that was it. Dad was tone deaf unfortunately and couldn’t even carry a tune. 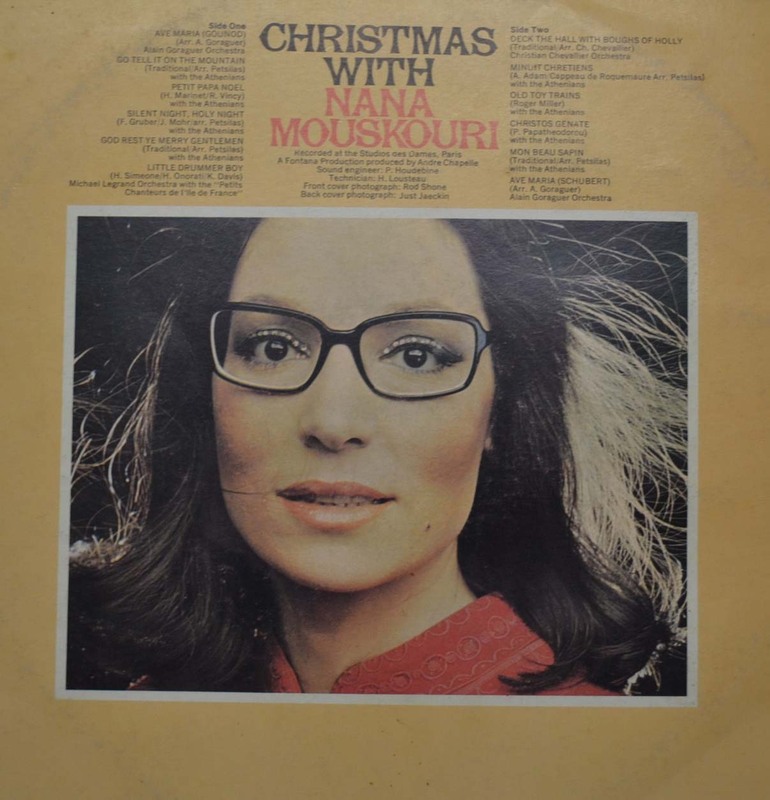 We would listen to the music on LPs once we got a player and one of our first Christmas records was one which included Oh Tannenbaum. That was when I was learning German so I guess we got it when I was in Grade 10. At church in Brisbane the band would play carols before and during Mass, but then let rip with the liveliest ones as the Mass ended. It’s a shame that the abuse of Christmas carols in shops as a marketing ploy has taken the edge off our enjoyment of such a happy part of Christmas. For a very long time our family would go to Carols by Candlelight in the park in Brisbane – our youngest even went when she was only a few weeks old. It was a very special part of our family’s Christmas tradition until it became way too commercialised and tacky. We love listening to a CD we have of Carols from Oxford…just so relaxing. Can I remember that far back? I guess the traditional ones like Silent Night and Away in a Manger then as a teenager Oh Tannenbaum. As an adult, Feliz Navidad, the Little Drummer Boy, and Mary’s Boy Child are my absolute favourites. Our family didn’t do parties, period. I remember being taken to the Railway Club where I got presents but not every year. I was in Guides but again, I have no recollection of having parties there. Hmm, I guess I contradicted myself with the Gerehu parties above, but then I didn’t really see them as parties per se. Mum confirmed for me that we didn’t have Christmas concerts at my primary school, only St Patrick’s Day ones. We didn’t have them at All Hallows’ because every second year was the state-wide exam so we all finished school on different days. As I mentioned, we never went away over the summer holidays so mine were spent hanging around the house, playing with the kids who also were at home. I remember that at least once we went up to my aunt and uncle’s camp site at Noosa, right in the midst of what is now a very upmarket resort. My cousin says we stayed with them at least once, but I only remember visiting. I loved it when I got books as Christmas presents and could just hide from the heat and read…not that mum was so keen on that idea when there were jobs to be done <smile>. One Christmas in high school I read an entire collection of Dickens’ books which my cousin had left with us to mind. Since I read books like a glutton at a smorgasborg I’ve forgotten much of what I read. 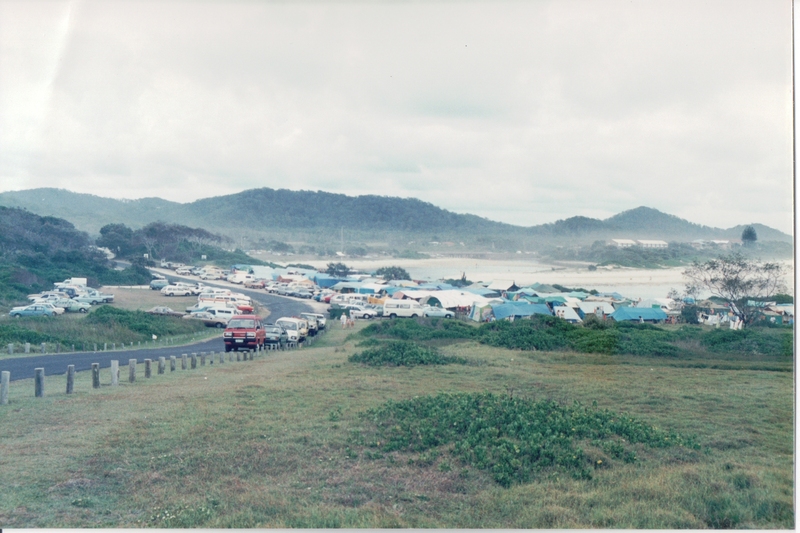 Christmas Holiday camping at Hastings Point in northern NSW….a packed “house”…better to just visit. 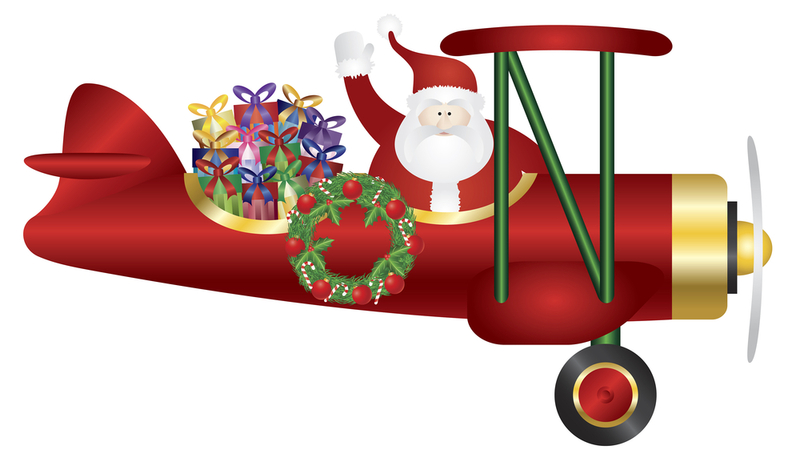 21 What is your earliest Christmas memory? Whew, my brain is stretched from all these questions….I don’t have a specific memory but I guess it might be the year I got my bride doll. Thanks Sharn for inventing this meme for us. I’m looking forward to seeing what others have written – it’s so interesting to see the things we have in common, and the ways we differ. 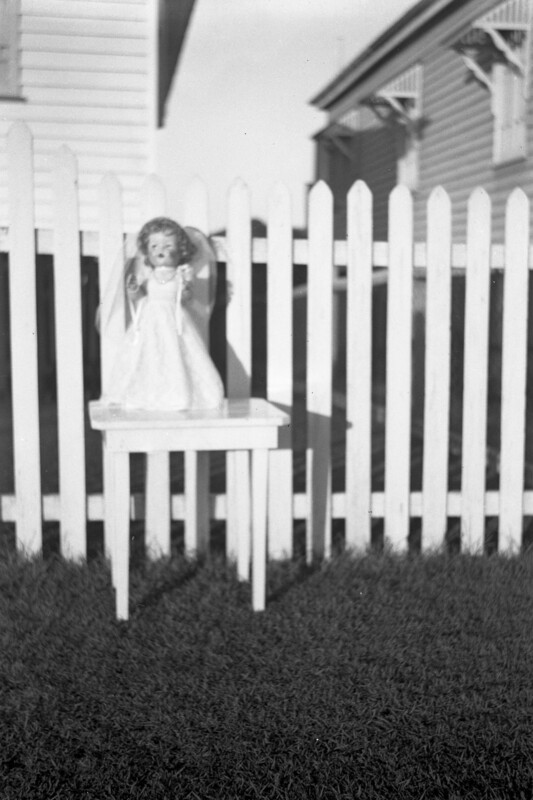 This entry was posted in Cass family history, Geneameme, Kunkel Family History by cassmob. Bookmark the permalink. My family didn’t do parties either. Family gatherings yes but not parties. What a vivid picture you paint, Pauleen! And I’m impressed at your memory. (I think there’ll be gaps when I come to do my post.) I wish Christmas weren’t so commercialised nowadays, but it was probably inevitable. Books for Christmas? Of course! One of the joys of the season, a lovely new book. Thanks Frances – I thought there was lots I didn’t remember but I also had the advantage of being able to cross-check my less reliable memories with Mum. Christmas without books is hard to imagine though perhaps less so now when they are more readily available.